Methi Paratha is a fresh fenugreek leaves Paratha, an indian flat bread. This Methi paratha recipe is a healthy variation of Paratha . It is made with fresh fenugreek leaves and whole wheat flour and served with curry , pickle and/or a cup of yogurt. This paratha is a very good way of eating your greens in a tasty dish. Children love it too. Sprinkle some chutney or spread some ketchup and make a roll and it is ready to eat or to pack in kid's lunch box. It can be eaten at breakfast, lunch or dinner. It is a perfect food to take for lunch or as picnic food as it is good to eat even after a few hours. Fresh methi (fenugreek) leaves - 2 cups. 1/4 tsp red chilli powder. Mix together flour, salt, chopped methi leaves, oil or butter. Add water little by little and from dough. Knead well. Cover and leave aside for 20-30 minutes. Heat girdle/tava. After it is heated well, turn heat to medium. Put the rolled round on the tava. Cook for 5-8 seconds. Cook on both the sides adding a little oil. Both the sides should have brown spots on them. Transfer to a closed container. Apply a little ghee or butter on top if you wish and keep covered till serving time . Serve hot by itself of with any curry, pickle and yogurt or tomato ketchup . 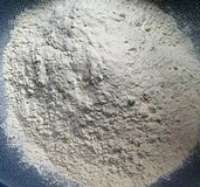 What kinds of flours are used in indian breads? Bhatura - A variety of Indian Fry Bread served with chickpea curry. 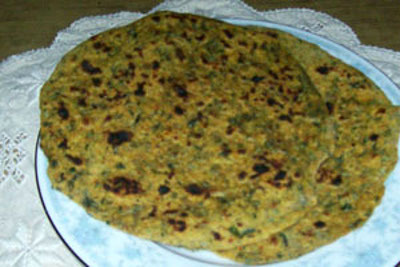 Palak Poori - Spinach flat bread.